Three months ago, after a campaign led by Mayor Mitch Landrieu, New Orleans became the first major city to effectively end Veteran homelessness. During an intense six-month campaign, community partners connected every Veteran living on the street or in emergency shelter who would accept housing with an apartment of his or her own, with supportive services scaled to the Veteran’s needs. Now we actively work every day to maintain a “functional zero” in Veteran homelessness by housing any newly homeless Veteran within an average of 30 days. 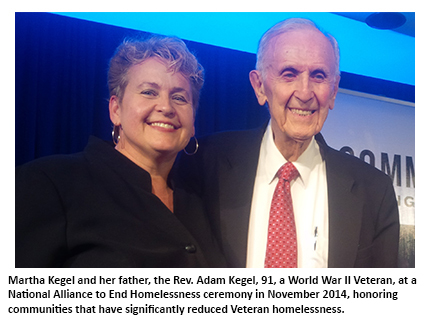 I firmly believe that every community can and should end Veteran homelessness. Yes, New Orleans had some advantages. For one thing, the local VA and its partners had already achieved a significant reduction in Veteran homelessness before we started the final drive in June 2014. At that point, we had already driven down the number of Veterans suffering in homelessness from 660 in the January 2011 Point-in-Time (PIT) count to 193 in the March 2014 count. For another, we have a very strong visionary leader in Mayor Mitch Landrieu, who set the bold goal of ending Veteran homelessness a full year before the federal deadline, convened the key players, and recruited active duty military and Veteran groups to help with outreach. But in other important ways we were at a distinct disadvantage: as of the 2014 PIT count, New Orleans still had one of the highest per capita rates of Veteran homelessness in the nation as compared to our general population of only 379,000 residents. We were also at a disadvantage in resources: compared to many other cities, we have precious few ways to pay for housing and services other than federal funds. And when pushing ourselves to get to zero, we were confronting the challenge of housing those whom we had always failed to connect to housing before -– those Veterans who tended to have the most complex challenges and who for the most part were not eligible for HUD-Veterans Affairs Supportive Housing (HUD-VASH) program. Enlist your Mayor. If your Mayor has not already done so, ask him or her to endorse the First Lady’s Mayors Challenge to End Veteran Homelessness, to set a deadline for your community, and to appoint an effective leader – in our case it was the Mayor’s aide Sam Joel—to convene weekly meetings of leaders of the homeless service providers network, the VA, and other major funding partners and hold everyone accountable. I firmly believe that intense deadline pressure is the only way to plow through the formidable barriers that keep Veterans homeless. If your Mayor is not able to lead this cause, ask someone with special clout in your community to do so. Make a comprehensive Master List of all Veterans experiencing homelessness living on the streets and in emergency shelter. You cannot end Veteran homelessness unless you are focused laser-like on those who will otherwise show up as living on the streets or in a homeless shelter in your 2016 Point-in-Time survey if you do not connect them with housing. Start with those identified in your 2015 Point-in-Time count, then add those identified by your Homeless Management Information System and your local VA health care outreach team as still living on the streets or in emergency shelter. Update your Master List every day with the names of those newly found in emergency shelter. Make a concerted effort to regularly scour the streets for Veterans. 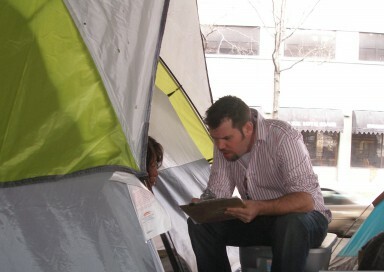 If your community does not have a professional outreach team able to do this, organize one or two Veteran Outreach nights each month in which all the homeless “hot spots” around your community are searched during the late hours of the night or early hours of the morning when persons experiencing homelessness are likely sleeping. This effort can be staffed by the same people who do the street count for your annual PIT survey, with help from active duty military and the VFW. Just as important as who you add to the Master List is who you do not add. Do not add Veterans to the Master List based solely on self-certification of homelessness or based solely on homeless certification by family or friends or by professionals who have not actually seen them sleep on the street or in shelter. Resources to permanently house people experiencing homelessness are scarce. You cannot effectively end Veteran homelessness unless you are making sure these resources are used only by people whose literal homelessness is independently documented. Those who are experiencing chronic homelessness on the streets or in a shelter should get first priority. In our community, the creation and daily maintenance of the Master List is done by the Continuum of Care (CoC), but the VA is a very strong partner in that process and committed to cooperating with the CoC on a daily basis to the maximum extent legally possible. In our community, the commitment to end Veteran homelessness starts with the VA director, Fernando Rivera, and his top administrators. Garry Laborde, the VA’s Assistant Chief of Mental Health, deserves special mention for his effectiveness as a daily liaison helping to manage our community’s campaign to achieve and maintain a functional zero. Target your housing resources. Make sure those on your Master List are highly prioritized for every housing resource. The best way to improve targeting is to report weekly to all partners on how many Veterans from your Master List were housed by the various resources: Supportive Services for Veteran Families (SSVF), HUD-VASH, Permanent Supportive Housing (PSH), rapid re-housing, housing authority vouchers, and any other major resource. Ask each partner to commit to a specific percentage of these resources that will go to housing Veterans from the Master List. Virtually all HUD-VASH vouchers should go to those on the Master List, and SSVF grantees should be asked to heavily prioritize those on the Master List for rent assistance. What may be less obvious is that CoC and rapid re-housing resources must also play a significant role. In New Orleans, 52 percent of the Veterans in our June-December 2014 campaign did not qualify for HUD-VASH, the vast majority were severely disabled and needed PSH, and even those who did not need PSH often needed a longer period of rent assistance than SSVF rules allow. Using SSVF and rapid re-housing as a bridge to HUD-VASH and CoC PSH is a key strategy in New Orleans’ ongoing success in achieving and maintaining a functional zero. Perhaps the most important key to ending Veteran homelessness is passion and determination. You will need to work up a full head of passion for this cause, if you are to plow through the considerable obstacles and resistance you may encounter to prioritizing resources differently and getting an overwhelming amount of work done quickly. Think deeply about the fact that all Veterans experiencing homelessness made tremendous sacrifices and took risks on behalf of the rest of us. Even those who never saw combat risked that possibility. Many Veterans came from humble circumstances and did not have a lot of options at the time they went into the service. Those humble origins are a key reason that many are experiencing homelessness now. It is immoral that any Veteran should be left to sleep on the streets after what they risked and sacrificed—so that most of the rest of us do not have to. Martha J. Kegel is Executive Director of UNITY of Greater New Orleans, a non-profit organization that leads the homeless Continuum of Care in New Orleans and partnered with Mayor Mitch Landrieu, the VA and other agencies to end Veteran homelessness in New Orleans. For more information about how New Orleans effectively ended Veteran homelessness and instituted a Rapid Response System to quickly house newly homeless Veterans, please visit www.unitygno.org.